"Joel and Denise are exceptional. They are professional, smart and incredibly knowledgeable about the increasingly complex real estate market on the Sunshine Coast. They have the expertise and know how to work with clients whether you are buying, selling or doing both. Throughout every transaction, their experience, abilities, integrity and ethics are clear. Beyond their real estate skills, the pair also bring something special to their work - they actually care about their clients and understand that the buying and selling of a house is so much more than a financial transaction. The outcome for their clients matters to them and, in our experience, that is rare and refreshing. They sold our home very quickly and helped us navigate through the sometimes complicated, often emotional process of closing the sale. They always have a positive attitude that is focused on what is best for the client, while making sure we understood the realities of how everything works. Their expertise and professionalism is unparalleled (believe me, they are impressive), and their results speak for themselves. I recommend them without hesitation to anyone looking to buy or sell a home - they are the best of the best." 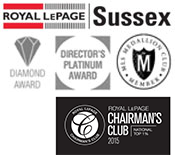 "Congratulations on achieving Royal LePage's Chairman's Award for 2015. This recognizes that you are one of the top 1% of over 17,000 Royal LePage Salespeople in Canada. Your clients can be assured that they are in the best of hands with one of Canada's top salespeople on their side. We are proud to have you on the team and I'm honored to be part of it." “Denise and Joel have been extraordinarily helpful in the acquisition of our Sunshine Coast waterfront property. Their attention to detail combined with exceptional knowledge of the area have made our project enjoyable and rewarding. “Wow, where do we begin! Having bought and sold seven properties in BC, we can say, without hesitation, that Joel and Denise are the most professional and knowledgeable real estate/relocation agents we have ever had. They took their time to get to know us, gave generously of their time, advice and experience, spent countless hours showing us houses and, ultimately, Denise and Joel led us to our dream home – a house that wasn’t even on our list! "We LOVE the house!! Thank you so much for helping us get this place - And she said YES tonight on our new patio."